Never before in US history has the side defeated in an election tried to make the country ungovernable and sought to divide it, to prevent the incoming administration from running the nation, says Gregory Copley, editor of Defense & Foreign Affairs. The State Department said it will allow people from the seven countries hit by US President Donald Trump's travel ban to the United Sates if they have valid visas. 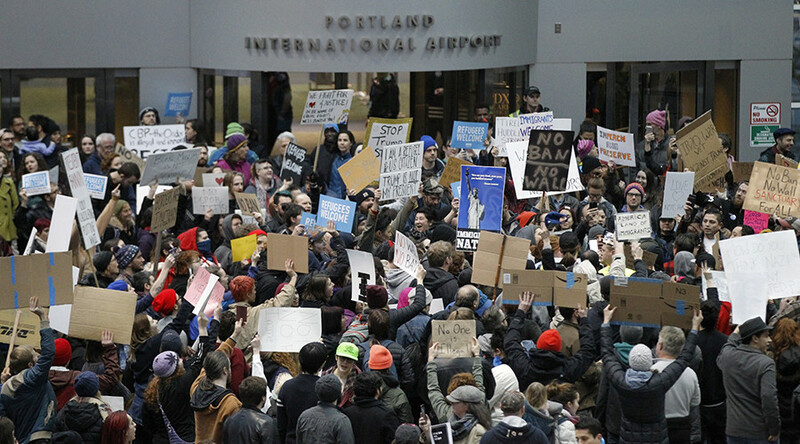 The move was made in order to comply with a Seattle federal judge's temporary lifting of Trump's travel restrictions. Meanwhile, a US appeals court denied the Trump administration’s request to reverse Friday’s order by the federal judge. RT: What do you make of the US State Department announcement that it will now allow in people from the blacklisted countries so long as they have valid visas? Gregory Copley: It is actually the Department of Homeland Security really which is doing it. The reality is, what we’ve come to expect is the outrage and misinterpretation which we’ve seen from the same people who called before the November elections on Donald Trump to respect and be moderate and contrite in his acceptance of his defeat in the election. And the side that actually lost is not doing anything of that kind at all. The reality is that there is a lot of hype over literally everything and anything which Trump says. Trump doesn’t shy away from that, and his statements tend to be provocative and loud, looking at the substance of anything they are looking at, the great news attention... from Trump’s tweets and... their own outrage in the society as a whole. California and Seattle, Washington are hotbeds of urban leftism. So, this is to be expected, there is nothing surprising in this. Frankly, there are a lot of people in 49 other states who want California to secede anyway. But the reality is that it is going to come to nothing, I believe. But we are seeing profound change in US society. RT: Trump's policies seem to be deeply dividing the US. Is that a trend that will continue? GC: The left camp of the Democratic Party and those supporting former President Obama and Hillary Clinton are going to try to provoke at every turn. There is no question that they are seeking to divide the country, they are actively working against Trump getting any mandate to run the country as a whole. This is unprecedented in US history, where an outgoing administration and the defeated [side] has actually tried to make the country ungovernable. And that is exactly what they are trying to do. My belief is that it won’t succeed. And what we are seeing in Washington DC is actually a return to business as usual far more rapidly than I would have thought. I mean, we are seeing the implementation or adoption of policies by the Trump administration which could have been policies undertaken by the Obama administration, or the Clinton administration, or the George W. Bush administration. We are seeing that, but the mood of the population as a whole in the majority of the states is not to hope for a return to business as usual. I think what we are seeing in the US and in western Europe is what we saw in the late period of the Soviet Union, where people are tired of this urban-lead globalism. People are saying, “we want our country back.” That’s what we saw in the 1990s in Russia, when Russians were literally saying “enough of this globalism, we want our country back.” It is happening again in Britain, in western Europe, and in the US and elsewhere. Ted Rall, political cartoonist, called the latest developments over the travel ban “an embarrassment” for the Trump administration. “There was not much choice on the part of the Trump administration. A number of federal judges, in other words, on the level just below the Supreme Court, and judges who normally get their decisions approved and ratified by the US Supreme Court, have been categorical that Trump’s ruling was anti-constitutional, probably under the Equal Protection Clause of the US Constitution, which prohibits treating one class of person differently than another, even though these are not US citizens." “The fact is there is also a 1965 law passed under the administration of Lyndon B. Johnson that makes Trump’s immigration ban on seven predominantly Muslim nations to the US probably illegal... according to most legal experts,” Rall added. Ted Rall suggested that “this was inevitability, it is an embarrassment for the administration." “They have only been in office for two weeks and they’ve already had their first significant policy initiative shot down like a clay pigeon by a bunch of legal sharpshooters,” he added.